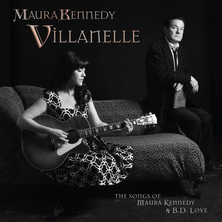 Maura Kennedy's second solo album, "Villanelle: The Songs of Maura Kennedy and B.D. Love," was released May 12, 2015 on the Varese Sarabande record label, distributed by Universal Music Distribution Group. All songs are collaborations between the lyrics of widely published poet, B.D. Love, and the music of Maura Kennedy. All the songs were co-written in the fall of 2014 in a great, creative burst, and the recording was finished before the winter holidays. Mixed, mastered and ready to go, "Villanelle: The Songs Of Maura Kennedy And B.D. Love" has been released on the Varese Sarabande label. Thanks to WFUV host John Platt for including "Villanelle" on his top ten albums list of 2015! Order your copy of "Villanelle..." here. SOLD OUT. 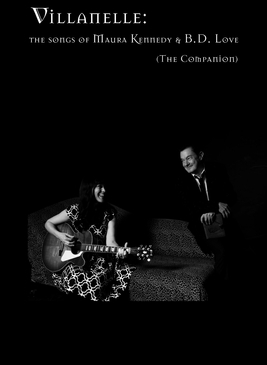 Limited edition companion book to the CD, "Villanelle: The Songs of Maura Kennedy and B.D. Love." This 100-copy numbered & signed 56-pg, high-gloss book is now SOLD OUT. Listen to Maura Kennedy, along with her husband, Pete, perform live on John Platt's "Sunday Breakfast" radio show on WFUV, New York City. We played songs from all three of our new albums, including "Villanelle..."
Read Allan McKay's four-star review of "Villanelle" for MusicRiot.co.uk here. You can hear the song, "I Cried To Dream Again," and read what Patrick J. Keane wrote about it in literary journal, Numéro Cinq Magazine here! "She Worked Her Magic On Me"
New Video: "Father To The Man"
I made this one just in time for Fathers Day using all fan photos you submitted of your Dads and Grandpas! See the new music video for "Father To The Man" It's a sweet and loving tribute. 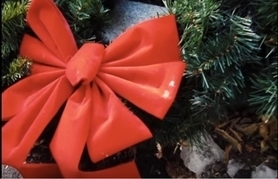 See the new video, "Beneath The Mistletoe"
released a solo album, “Villanelle,” which features songs she penned with her friend, poet B.D. Love. Their collaboration has resulted in unforgettable songs, performed with brilliance. Maura’s voice entrances on such numbers as “Bicycles with Broken Spokes,” “I Cried To Dream Again,” “Firefly,” “She Worked Her Magic On Me,” “Coyotes” and “Be The One.” And her melodies flow ever so tenderly and naturally over the beautiful, elegant lyrics provided by Love. There are 15 tunes here and each is a carefully cultivated gem. WATCH THE VIDEO FOR "The Thing With Feathers"
Member of The Kennedys for twelve CDs, Maura wrote, recorded, and produced her long-awaited, 13-song debut solo CD, "Parade Of Echoes", available here. "The color and vibrancy of Maura’s voice is mesmerizing. This is a woman whose voice demands that you listen." "Parade of Echoes is a shimmering blend of classic-sounding pop and folk, with gorgeous harmonies. And Maura's songs are catchy, to be sure, but also brimming with intelligence and vivid imagery. " "On her first "solo" venture, Ms. Kennedy unleashes her better pop angels and her most tormenting demons on "Parade of Echoes," a near-Spectorian symphony of ebullient/anguished ruminations on any True Lover's worst fears, denials and fervent hopes." "Over the last fifteen years we've come to expect only Maura Kennedy's best. "Parade of Echoes" surpasses those great expectations...an extraordinary solo debut"